Tomorrow, the U.N. Intergovernmental Panel on Climate Change (IPCC) will release its fifth assessment report, the first since 2007. An early version of the report leaked more than a month ago, and the official version isn't expected to tell us anything new. If anything, its conclusions will be on the conservative side. An aggregate of scientific findings, the report will likely reflect near-consensus on the following, as quoted in the Guardian: "Global surface temperatures have risen by almost a degree in the last century. Sea levels have risen, while snow and ice cover has dropped significantly. Coral reefs are being destroyed and weather patterns are becoming wilder and less predictable." For the first time, it will state that scientists are 95 percent certain that climate change is caused by human activity. 1. "And now it's global COOLING! 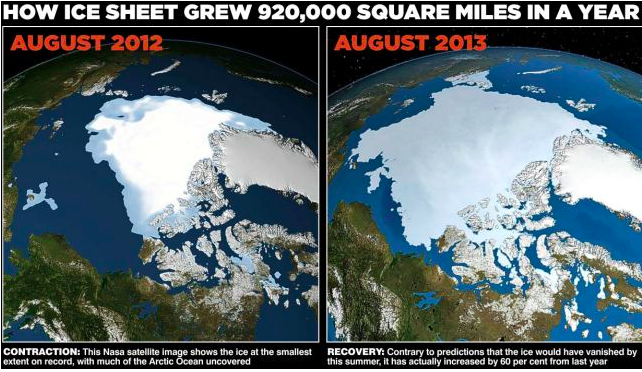 Record return of Arctic ice cap as it grows by 60% in a year"
The Daily Mail ran with this headline on Sept. 7, illustrating it with "proof" from NASA satellite images of the Arctic ice sheet. 2. "World's top climate scientists confess: Global warming is just HALF what we thought -- and computers got the effects of greenhouse gases wrong"
This second whopper from David Rose, published in the Daily Mail, got corrected after numerous experts pointed out that he was flat-out wrong. Before the correction was made, though, several publications repeated the claim, and Rush Limbaugh happily announced that "climate models have all been wrong" before reading the first several paragraphs of Rose's article on the air. 3. "Climategate II: leaked emails show struggle to deal with warming lull"
Fox News slapped this headline on an AP story about the IPCC in a complete misinterpretation of what the article actually said. The Daily Mail picked up on the "scoop" as well ("World's top climate scientists told to 'cover up' the fact that the Earth's temperature hasn't risen for the last 15 years"), and was then parroted by the Daily Caller ("US and Europe tried to cover up data showing lack of global warming"). The truth is nowhere near the scandal it was made out to be. The leaked comments, according to Media Matters, didn't contain any information that hadn't already been discussed publicly by IPCC members. All the emails show is that they were discussing how to deal with that familiar tactic used by climate deniers: pointing to a recent decline in warming to "disprove" climate science instead of acknowledging the realities addressed above. 4. "Report says global warming claims exaggerated"
But that report wasn't the IPCC assessment -- it came from the NIPCC, or Nongovernmental International Panel on Climate Change, which concluded that climate change will likely be "modest and cause no net harm." The NIPCC has no standing whatsoever. It is not a reviewed document, it is not open for review at any point and it contains demonstrable garbage and falsehoods. In contrast the IPCC process is rigorous, open and there are 2 major reviews. This is irresponsible journalism. 5. "Dialing Back the Alarm on Climate Change: A forthcoming report points lowers estimates on global warming"
Matt Ridley, no stranger to climate denial, tied his most recent assertion that global warming isn't so bad -- and might even be a good thing! -- to IPCC leaks in an essay for the Wall Street Journal. Sensitivity is very likely to be higher than Ridley’s suggestion (based on only two studies, one from 1937) of 1.6º C.
Even a low sensitivity would mean bad news for our climate on our current, business-as-usual emissions track. The benefits of CO2 that Ridley cites are wildly overstated. "The true take-home message of the latest IPCC report is crystal clear," writes Mann. "Climate change is real and caused by humans, and it continues unabated." Anything else you hear should be taken with more than a few grains of salt.